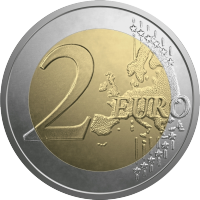 A geographical image of Europe, the number "2" and the inscription EURO. A nesting stork is featured on the national side of the coin. From mid-April to the end of August, Latvia's country landscape is dotted with nests of the white stork (Ciconia ciconia), and during this period people are used to listening to the sounds of bill clattering and to seeing these lanky-bodied birds in the vicinity of ponds and rivers. The black stork (Ciconia nigra), on the other hand, is a widespread yet uncommon bird, seen rarely in marshy areas or inland waters hidden in ancient forest tracts. Most of the white and black stork population nests in Europe. As their current species and habitat conservation status is inadequate, these species are distinguished by the European Parliament and Council Directive as requiring special protection measures to ensure their survival and breeding. The black stork is among the European nature conservation flagship species; 10 years ago, a conservation action plan for the protection of the black stork was adopted also in Latvia. Latvia has participated in all campaigns of the white stork nesting site count since 1934, also in the latest 7th International White Stork Census held in all European countries in 2014–2015. Often designated as the land of storks, Latvia is proud to be the place where almost 5% of the total global white stork nestlings come into the world. 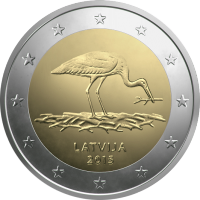 To celebrate the 30th anniversary of the Latvian Ornithological Society, a 2 euro commemorative coin featuring the image of a stork is issued.